Everything appeared to be perfect - until the first set of paying passengers, myself included, boarded the world's largest cruise ship for a mini cruise to Rotterdam. The press went on a free two-night cruise alongside travel agents. Most waxed lyrical about the ship. The Guardian was perhaps most critical although Condé Nast Traveler, Pocket-Lint, Daily Mail, The Independent, and others all gave glowing accounts. Segments for breakfast television shows were filmed onboard by the BBC and ITV. The coverage was exceptionally positive. The PR agency that handled the textbook launch certainly deserved credit. However, it all turned sour the moment the press left the 226,963 gross tonne ship on Sunday 22 May 2016. My family were amongst the first paying guests to try out the £800 million cruise ship. Soon after the media quickly turned and suddenly the unofficial nickname "Disharmony of the Seas" became a thing. A sea of tradespeople was undertaking an enormous amount of work alongside holidaymakers. A mass of cables, uncapped holes, ladders, machinery, and various other trip hazards. Dusty and dirty outdoor public areas. Wet paint, fillers, and coatings on the walls and floors. Closed attractions with teams working on them. Missing safety glass (these were few and far between, but temporary scaffolding stood in place). Plumbing troubles leading to blocked urinals, lack of hot water, or a lack of running water altogether on some decks. Sadly we experienced all these onboard. I booked my family onto this cruise to make up for cancelling our planned holiday aboard sister ship Allure of the Seas last year to fund alternative sailings with Carnival and MSC Cruises. This mini cruise was the cheapest way to experience an Oasis-class ship without the need for flights. The cruise line added four- and three-night mini cruises before the official inaugural cruise from Southampton to Barcelona. This move ruffled the feathers of those booked onto the 'maiden' voyage who were disappointed to discover they would not be the first paying passengers onboard. In hindsight, I am sure they were relieved. Smart check-in was incredibly swift, and within just 10 minutes we had checked in, cleared security, and were onboard. As we stepped onto the ship, the sailing suddenly rebranded from a "four-night short getaway cruise" (as invoiced) to a "four-night preview cruise," a move that angered many passengers. The more Cruise Director Ken Rush mentioned the word "preview" - and he did it a lot - the angrier passengers became. "Preview Cruise," as we discovered, was code for "there's about a week's worth of work left to do so expect a lot of construction work, disruption, and disappointment." As a cruise blogger, I am not naive. I certainly didn't expect everything to be perfect. I expected niggles on the first cruise as happens on every maiden cruise. Doors that open slow; water leaks; waiters unfamiliar with the layout of the restaurants; no high chairs in the family-friendly Johnny Rockets restaurant - understandable minor issues that would not ruin a holiday. I did not expect the scale of the remaining construction work. At no point was I warned about the sprawling army of contractors that would share my holiday with me. The paint hadn't even dried by the time the first passengers had boarded, a fact my two-year-old discovered as he ended up with marine grade paint on his hands on our cabin's balcony. He went on to repeatedly find thick brown dust on the balcony throughout the cruise. I'm thankful we caught these before curiosity got the better of him and he tried tasting these substances. The unannounced 6.30 am wake-up calls with the sound of angle-grinding around the AquaTheater area was not the best way to start the day, especially as the noise from the late night AquaTheater rehearsals kept my son awake late into the evening. Many of the flagship attractions were unavailable. My son could not understand why he was not allowed in the wonderfully vivid Splashaway Bay kids splash park. The pallet of building materials at the foot of the slide explained why. The key attraction, the 10-storey Ultimate Abyss, was open (so long as it was not raining, being a fair-weather attraction). It delivered everything it promised to as the world's tallest slide at sea - a 15-second thrill ride with audio and visual effects. 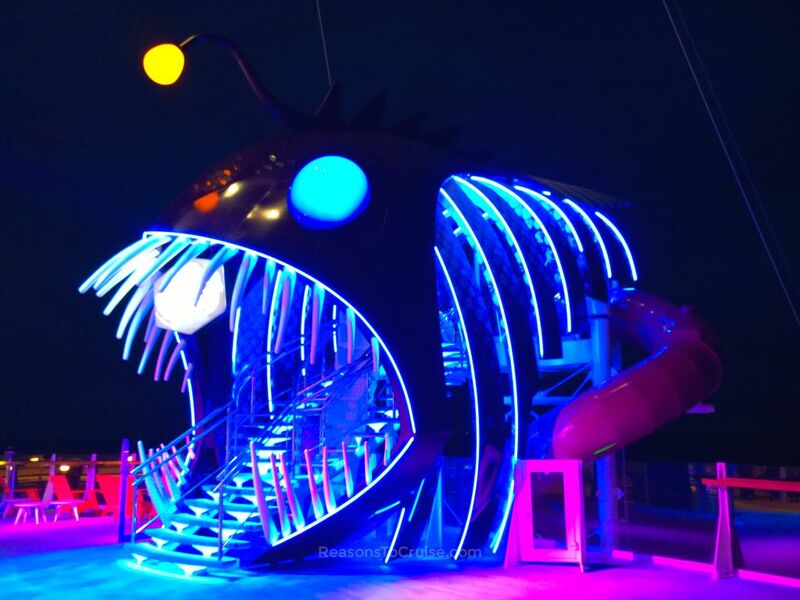 By night, the illuminated entrance became one of the many unique pieces of artwork onboard. The water slides were closed, despite Royal Caribbean sharing video footage of American actor and singer Carlos PenaVega riding the Perfect Storm for the first time on social media. The zip wire, shorter on Harmony of the Seas than on her sister ships due to the extended Windjammer restaurant, was closed for half the cruise while contractors finished the landing area. 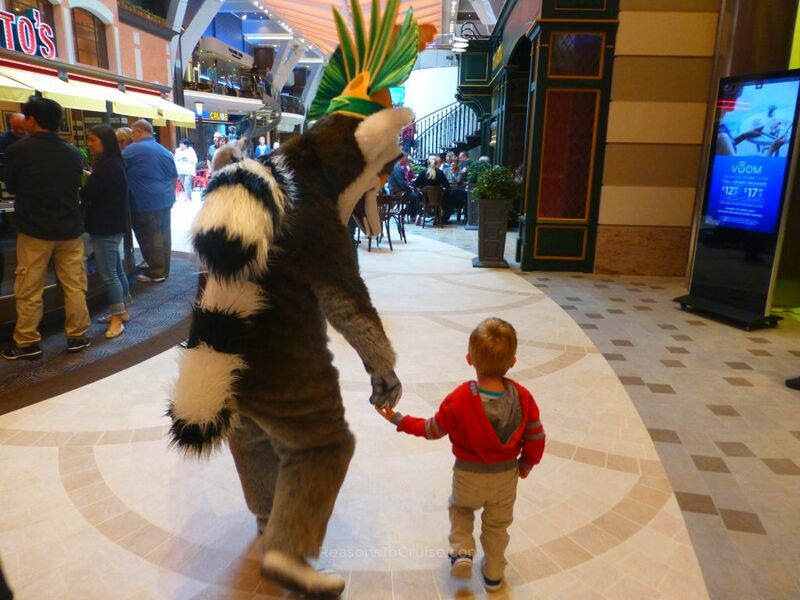 But my two-year-old was not interested in things he was not allowed to do (height limits on many attractions mean there is little toddlers can do onboard). Instead, our cruise revolved around (many) rides on the traditional carousel on the Boardwalk as well as the interactions with the DreamWorks characters. The DreamWorks characters were by far his most favourite aspect, a point that makes me more confident he would love a Disney cruise. The DreamWorks character breakfast, similar to Carnival's Seuss Breakfast as far as I can tell, was not available on this sailing but I imagine it would have gone down very well if it were. While the ship did not have its maximum of 6,410 passengers onboard alongside the full complement of 2,100 crew, it did feel busy, particularly at meal times. Walking lengths of the ship in search of a restaurant with a spare table certainly built up an appetite. Seating in the complimentary restaurants was cramped, with Coastal Kitchen (exclusively for suite guests) the exception. In the Windjammer buffet restaurant, the areas around the food stations were pleasantly expansive, resulting in a marked improvement in the flow of passengers but at the cost of tightly packed tables and chairs. You should not have to get out of your seat so that others can pass by you during your meal. The cruise line encouraged pre-booking meals and performance tickets through its Royal IQ app to avoid lengthy queues and disappointment. Those of us without an Apple or Android device on holiday had to use the IQ stations dotted around the ship. The in-cabin television could display bookings but was not equipped to make them - a glaring oversight. Pre-booking is not a great system for parents with infants and toddlers. Two-year-olds are not known for their understanding or patience. We had pre-booked an afternoon performance of Grease in good faith but at the time my son was not in the right frame of mind to endure a 90-minute performance. A late-night AquaTheater rehearsal. Sound checks and rehearsals ran up to around midnight. 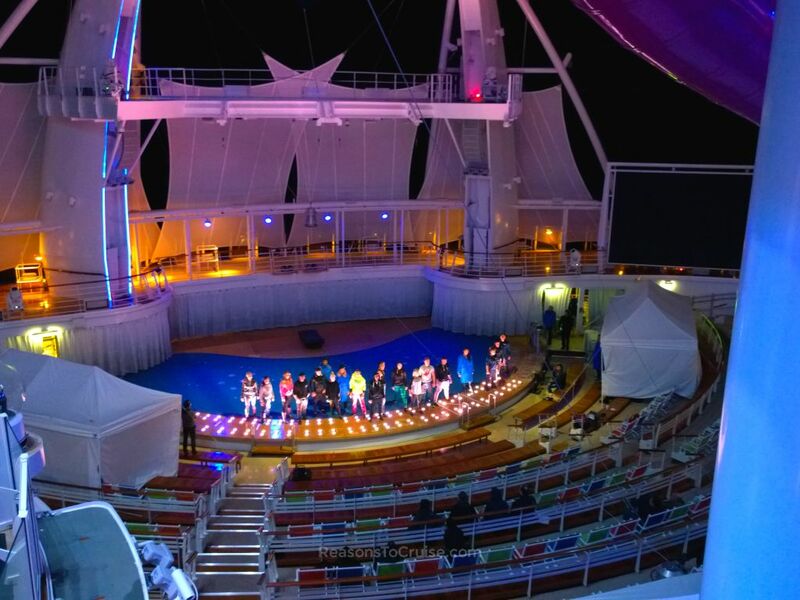 World class entertainment performances is an aspect of cruise holidays that Royal Caribbean dominates. The cancellation of the AquaTheater show was most disappointing, especially having booked a cabin with a prime position by the theatre. 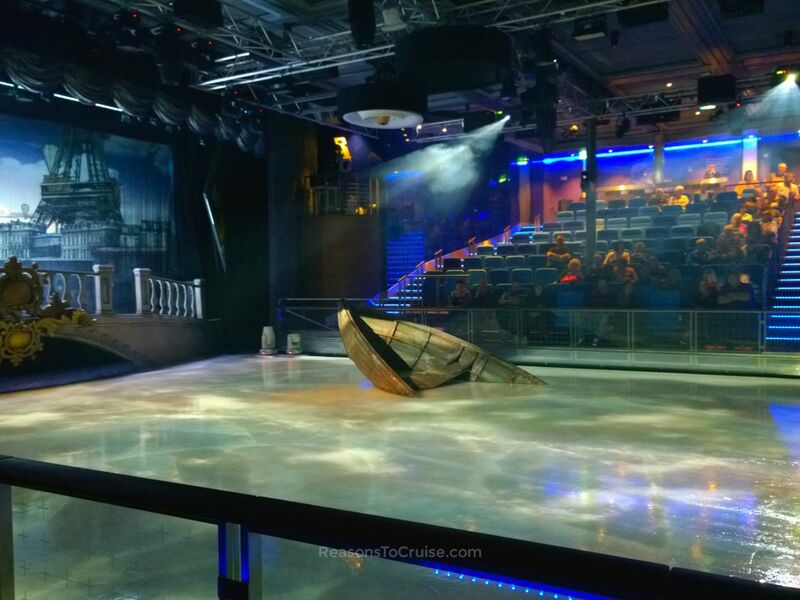 The '1887' ice show was as good as any other, although many passengers did not follow the storyline. Where you have tickets and can attend a show, ensure you arrive early. We followed the advice and head to Studio B nearly an hour before the show to secure seats. Admittedly, that is an extra hour trying to keep a two-year-old on the right side of happy - and that is an hour I could have spent elsewhere. But the venue filled up rapidly, and 10 minutes before the show, all reservations expired and selected numbers standing in the standby queue filled the few remaining seats. This system confused and angered some passengers who had reservations but turned up late. 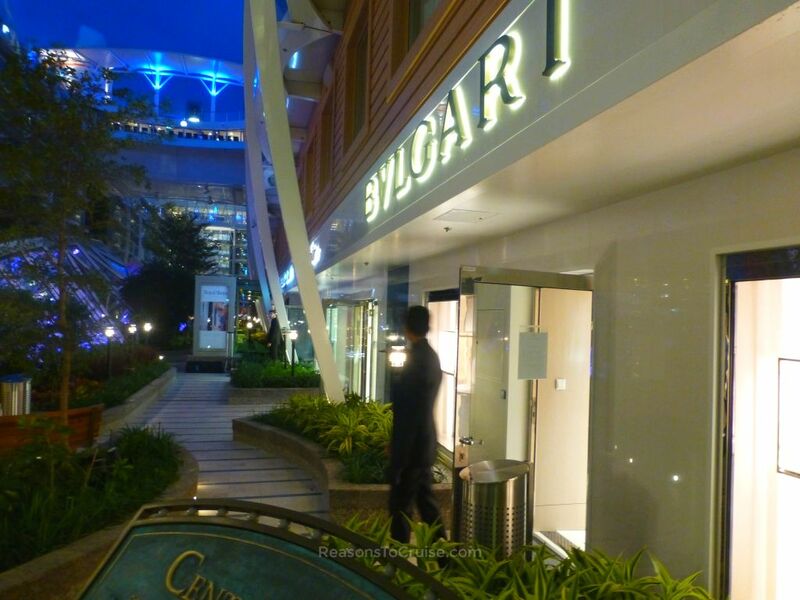 Shopping had become upscale with designer brands such as Bvlgari, Hublot, Omega, Cartier and Kate Spade dominating the marketplace. The logo shop, one of the few retail units where I could afford to buy anything, was a cramped space but one of the most popular. Starbucks briefly opened before being closed again for more repair works. Café Promenade absorbed those looking for a coffee although it too occupied a smaller space than it deserved. Selected Quantum-class features made it onboard. Wonderland is a larger, two storey affair but at the cost of its magical ambience. 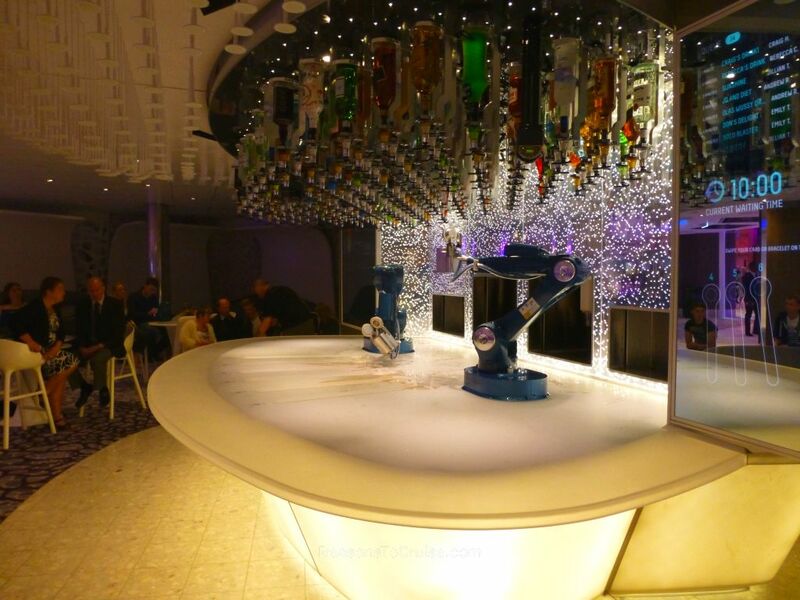 The Bionic Bar by Makr Shakr continues to be incredibly popular despite its slow service. Nowhere else would you happily wait up to 10 minutes for a drink to be made but here that did not put people off. My son loved watching its fluid motions and a trip to see the robots became a daily occurrence. When the robots made him a mean non-alcoholic concoction, it blew his mind. They did have the cheek to add an 18% service charge, though. Based on my experience across the four nights, and the much-improved experience reported on social media after that, it is safe to say Harmony of the Seas was released from the shipyard one week too early. In a statement to the BBC, Royal Caribbean brushed off the work as "finishing touches" and that the "great value" pricing compensated for that. I paid more 'per person per night' for this cruise than a week-long cruise on Harmony of the Seas in the Caribbean would have cost. Yes, I did pay less in total for a four-night cruise versus a seven-night Mediterranean cruise on the same ship so perhaps that is what they meant by "great value" pricing. I certainly do not feel that the amount I paid justified the extent of the work and disruption. My son's place onboard cost just £60 less than my adult rate, and given the lack of open facilities for a two-year-old, this represents poor value for money. The fact that some travel agents branded the four-night sailing the "maiden voyage" only added to the disillusionment felt by some customers. I could not find any references to this being called a "preview sailing" before the departure date. I think the company has handled the affair particularly poorly, and its press statements appear to shrug off the complaints. Had this taken place in America, I wonder how vastly different the response would have been? Those that tackled the outrageously lengthy queues at Guest Services and complained onboard received compensation of up to 30% off their next cruise. To the credit of the crew, they took an awful lot of flack for corporate level decisions on this voyage. We enjoyed ourselves as much as we could given the circumstances. I certainly do not regret booking the cruise. I have ticked an Oasis-class ship off my bucket list. I visited Rotterdam for the first time. I can also say I have sailed on the world's largest cruise ship. I am disappointed not to have watched an AquaTheater show. I also discovered that there is such a thing as a ship that is too big. But drawing firm conclusions from this 'preview' cruise would be wrong. Harmony of the Seas is a beautiful ship once I looked beyond the construction works. Yes, I would rather have not sailed on a floating building site, but I would have been far more disappointed had the cruise been cancelled altogether. Had Royal Caribbean satisfactorily managed expectations, sent out a letter forewarning of building works, and offered people an option to cancel without penalty before the cruise, I suspect the sentiment after the first public sailing on Harmony of the Seas would have been very different indeed. This sailing was not a 'normal' cruise nor did Royal Caribbean demonstrate the WOW factor it prides itself on. 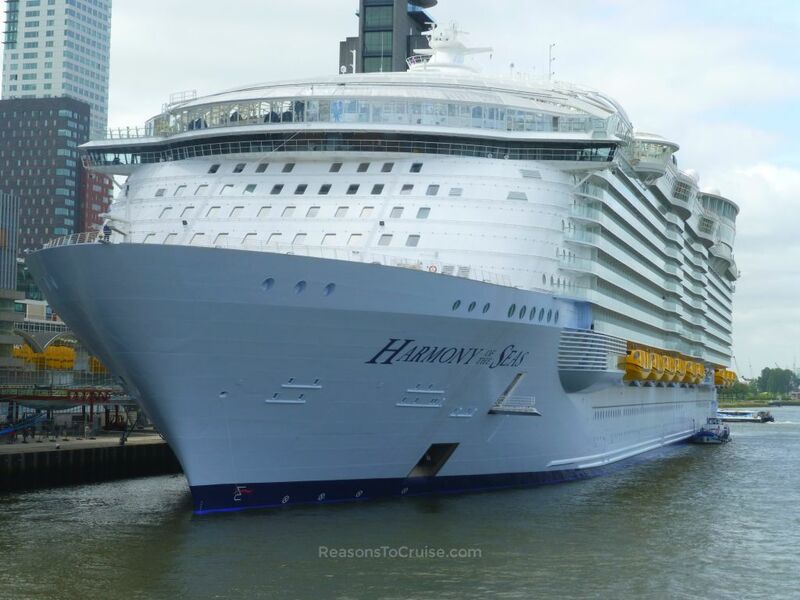 I would implore first-time cruisers disappointed with their experience on Harmony of the Seas to book another cruise with Royal Caribbean, perhaps on Independence of the Seas or Navigator of the Seas out of Southampton. 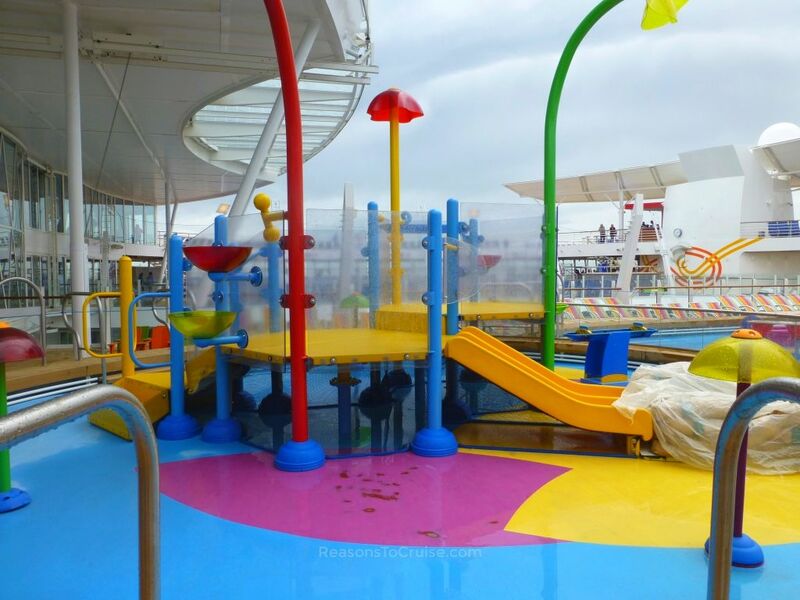 Experience the real Royal Caribbean on a finished ship where WOW's do come in abundance. 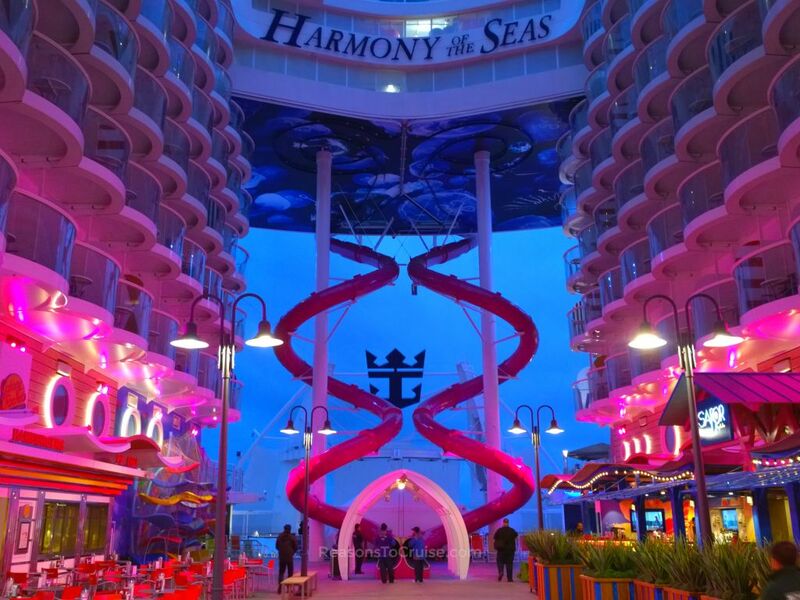 It is true to say Harmony of the Seas has something for everyone. On this sailing, its full potential was not clear to see. 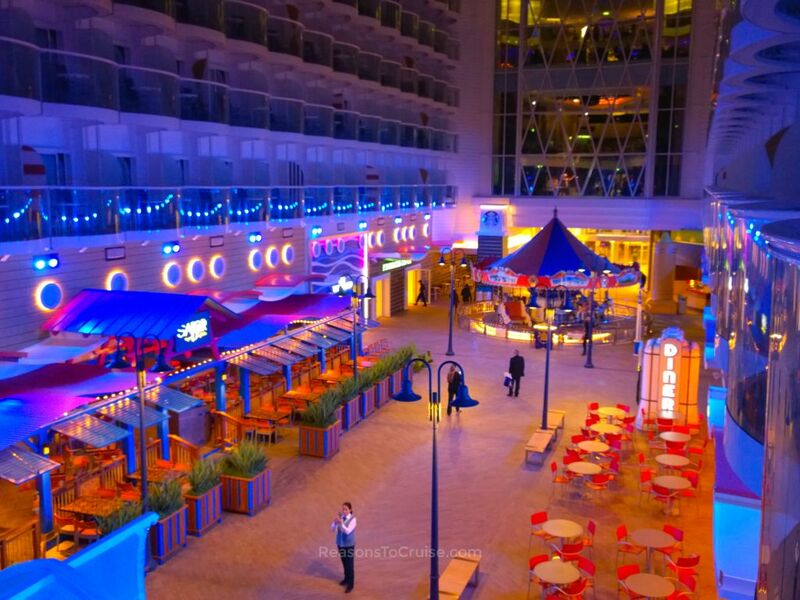 While I would not rule out sailing on Harmony of the Seas again, I would rather try out Oasis of the Seas or Allure of the Seas next to compare the experiences and to decide whether or not I like the Oasis-class ships. These long-running ships seem to be favoured by many, and in the hot Caribbean climate, I suspect they operate completely differently to the dynamic on Harmony of the Seas in the cold and wet Northern European climate. On 3 June 2016, Royal Caribbean sent out a mass email to customers on the four- and three-night sailings on behalf of President and CEO Michael Bayley. In it, he acknowledges "there were simply too many projects still being completed during the voyage." Guests aboard the so-called four-night 'preview' cruises will receive a future cruise certificate to the value of 50% of the cruise fare. Those on the three-night sailing will receive a future cruise certificate worth 25% of the cruise fare paid. The discount can be used against any Royal Caribbean ship and is valid for the next 18 months. Certificates will be emailed or posted out over the next couple of weeks. "After an early delivery, Harmony of the Seas set sail on her pre-inaugural voyage from Southampton on May 22, 2016. On a ship of such scale and complexity we were hopeful that all work would be completed in time for our first voyage, however we recognise that there were still simply too many projects being completed during this sailing. We offer our sincere apologies to all of our valued customers who were affected by this. The satisfaction of our customers is extremely important to us and to have the opportunity to welcome them again, we are offering each guest from the May 22, 2016, Harmony of the Seas sailing a future cruise certificate for 50% off the cruise fare paid, for their holiday. We are eager to welcome our guests back on-board and to deliver the experience that is anticipated and expected of a Royal Caribbean holiday." Were you on one of the first couple of sailings? Let me know what you thought of Harmony of the Seas in the comments below. Disclosure: I paid for this cruise holiday in full, together with transportation to and from the port. Royal Caribbean kindly supplied WiFi access, a meal for two in Wonderland and $100 onboard credit to cover incidentals. My opinions are my own. The fact that the ship was not ready in time meant that many of the advertised facilities were not available. The amount of construction work around the ship did not help. The mini cruise itinerary itself was great, and I am sure the ship would have been had it been ready in time. I was on the 4 night rotterdam sailing. Yes I did see much of what you said luckily for me the closed areas I wasn’t too bothered about. I certainly would go on her again. An update on the cruise credit. I received my 50% discount on Friday. Popped to my travel agent to see if I could use it on the Navigator of the seas a cruise I already had booked for later in the year. This cruise came with the free drink and gratuatity package. She rang rccl they said no problem it could be applied there and then. So I am extremely happy as it made my next cruise cheaper and would make me definitely use rccl again. Just to say though if they had informed me of the building work still going on I would still have sailed. This was a wonderful holiday and a great experience and would love to travel on Harmony again in the future. Enjoyed reading your article. We’ve just returned from the 3 night cruise, and came off very impressed. Yes there were still a lot of contractors onboard, including some grinding at 11pm at night on the pool deck! but generally things had quietened down abit from the previous cruise. Starbucks remained closed the whole trip, the kids water park was opened, as was one of the perfect storm water slides, but the other two on the port side were still being finished. The zip line was opened for all 3 days too. Speaking to one of the theatre assistants the day we got off, it was looking doubtful the Aqua theatre show was going to be ready for the sailing to Barcelona either! All in all, it was our first experience of a RCI ship, and I was very happy, although for me, anything other than an Oasis Class would be a step down! But deep down we are still P&O to the core. Thank you for the feedback. Oasis-class is certainly the biggest and once completed Harmony of the Seas will definitely be the best. I’m glad the ship was more completed in time for the 3 night sailing and hope that on the maiden voyage there’s nothing more than a few snags here and there. My godparents are on the trip down to Barcelona and from their photos on Facebook everything now looks shipshape! Starbucks is open and the Aquatheatre production is in full swing. Impressed and pleased with the 25% off emails that came through this evening from the CEO. Not that we asked or expected them or even needed them, we were very happy with the cruise! But may very well use them for another mini cruise in the future, and get the equivalent of one of the four of us for free! Great stuff! Could someone tell me if it will be the 26 or 27th May that the Harmony of the Seas is in Cherbourg? She leaves Southampton on the 26th, so will she sail overnight to arrive in Cherbourg the next day? Reason asking as we are plannng to pop over from Poole to see her. She departs Southampton on 26 May and will spend the day in Cherbourg on 27 May. A sea day follows before she arrives back into Southampton on 29 May. Hope this helps!